“Hey, there, my name is Bear. Yeah, yeah…just scoping the place out. The first interaction with a bear was at our campground. We all stayed in tent cabins. One night we heard shouts of “Bear cub!! !” and some of us ran out of the “safety” of our little cloth home. The scared little cub was running past the cafeteria area and people were perching on whatever they could find trying to get a good look at the cub in the night. I remember I steadied myself on an old lady’s fanny pack and my mother-in-law steadied herself on the back of a toddler. Very quickly, the cub was there and then disappeared. Nobody’s face got clawed beyond recognition. When we returned from our adventure, there were others in our little party who thought it was insane to attempt to get so close to a bear. After recently watching “Fatal Attractions”, I realize they were right. At that time, I just wanted to see a diggity-dang-doggone bear. flying fish who accidentally landed in Billy Earl’s boat on his way back down. ﻿﻿﻿﻿Fast forward a few days to our hike up the back of Half Dome. Halfway to Half Dome, my husband, my sister, my in-laws and I camped out. IT WAS VERY DARK. It was very spooky. I kept thinking of the Blair Witch Project. I remember that you couldn’t see your hand in front of your face once you turned off the flashlight. My husband, sister and I slept in one tent, my mother-in-law & father-in-law slept in another and my brother-in-law slept in his own tent by himself. The B.I.L. didn’t like that a-bear-may-be-hiding-just-behind-that-tree-trunk-and-may-try-to-rip-my-tent-to-shreds-looking-for-a-powdered-donut-while-I’m-sleeping business. Also? The B.I.L. needed his energy for the Half Dome hike the next day. He needed to get some sleep. How could he sleep when worried about a bear trying to have a slumber party with him??? 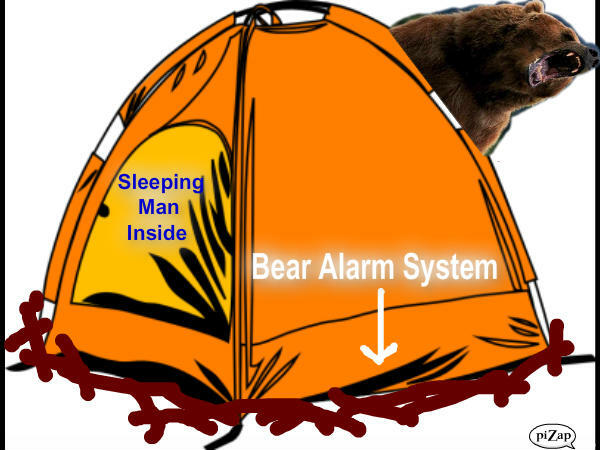 Being the creative and ingenious man he is, he developed a BEAR ALARM SYSTEM. He developed a way to be alerted to an oncoming furry, angry predator so that, in seconds, he could gear up and KAPOW! that bear right in his jewels. Or something like that. He put sticks around the outside of his tent. HAHAHAHAHAHAHAHAHAHAHAHAHAHAHAHAHAHAHAHAHAHAHA!!!!!!!!! Great idea, right?? If he heard a stick crack, he would be immediately alerted to the presence of a very vicious, hungry beast just outside the tent. We are talking INCHES here, people! This would undoubtedly give him enough time to wake up and put that bear in a headlock, right? YEAH, RIGHT! HAHAHAHAHA……(deep breath)………HAHAHAHA!!!! 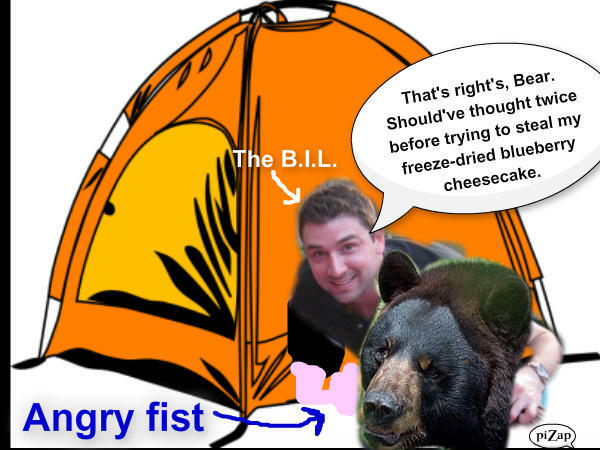 He told me later that he made that bear clean up The Bear Alarm System from around the tent and pose for a picture with him as punishment for scaring him 7/8’s to death. I think the bear said something like, “I don’t have to look happy about it”. I guess I shouldn’t have laughed at his Bear Alarm System. I feel stupid.